Sony's partnership with Minolta has yielded the Alpha DSLR-A100 system -- its first Digital SLR. The new camera features a 10.2 MP CCD image sensor. Sony is offering 19 lenses, plus the camera will be compatible with Minolta-mount lenses. Sony has brought many of its own innovations to this camera, such as its Super SteadyShot image stabilization and dynamic range optimization, combined Minolta-type brilliance including Eye Start AF and honeycomb pattern metering. 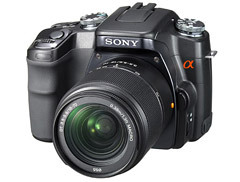 The A100 accepts CF cards and Sony's Memory Stick. The A100 captures in both JPEG and RAW formats. Because of the APS-sized sensor, the camera does have a 1.5x image magnification. The Sony DSLR will list for $899, and is expected to ship before the end of July. MyMac.com says: It's here, it works, it's affordable, and it comes with timely tech support. It's easy to learn, very easy to edit and export, and really impressive in its final output. It is FotoMagico, dynamic audio slide show software that will have your family, friends, students, teachers, or business associates all saying: "Wow, that was great. Do you think I can learn how to make a show like yours?" in its review of FotoMagico 1.5. Have you prepared your entry for the FotoMagico Slideshow Showcase? Submit your Entry Form, then start working on your presentation. Deadline is June 15. Don't delay! And don't forget... if you wish to use FotoMagico to create your show, you can get a $10 discount off the software by entering "Digital Story" in the discount code box. Visit the order page and select FotoMagico. You'll be able to enter a coupon code at the first checkout page. The code is set to "Digital Story". Once the code is input, and the Checkout button is clicked, the $10 discount will be reflected on the final order total page. Final two weeks for creating eye-catching slideshows before the top entries are shared with the world. The deadline for submitting work in the FotoMagico Slideshow Showcase is Monday, June 15. The showcase, sponsored by Boinx Software and run by The Digital Story, first helps photographers master the art of producing the perfect slideshow. Then, the best of the entries will be showcased to the world on The Digital Story beginning June 27. "Slideshow software has really evolved, so if you haven't looked at it lately, you should," explains Derrick Story, author of numerous photography books and creator of The Digital Story. "A good example is FotoMagico by Boinx Software. The software lets you produce shows as powerful as some of Ken Burn's earlier work, but with much greater ease." FotoMagico is available for $79USD, or on The Digital Story site for $69USD (See bottom of page for discount code). Forms and showcase rules are available at The Digital Story. Entries must be submitted by 11:59 p.m. PDT, Monday June 15 to be eligible for display. The Digital Story makes photography, music, and filmmaking more enjoyable through its regularly updated, educational blog posts, podcasts, and videos. The site is dedicated to showing visitors simple tips and techniques that help the digital camera become an extension of a person's vision and a tool for expression. The Digital Story can be contacted at questions@thedigitalstory.com. Boinx Software is a trademark of GeBE Computer and Peripherie GmbH. Based in Munich, Germany, Boinx Software develops and publishes fun and easy-to-use applications for the creative user. 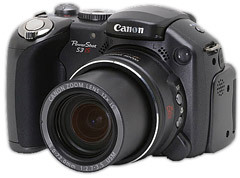 DP Review has just published an in-depth report on the tantalizing new Canon PowerShot S3 IS. The one feature that catches everyone's eye is the 12X optical zoom... and it's a good one too. Canon has bundled image stabilization with this high magnification creating a terrific "long range" shooter in a compact body. The swing out "tilt n swivel" screen is great for capturing at a variety of angles, and is a plus for movie mode. Another great feature, in my opinion, is that the camera is powered by 4 AA NiMH cells instead of a proprietary Lithium battery. In an emergency on the road, you can always substitute regular AAs if your NiMHs run out of gas. Canon does not, however, provide batteries with the camera, so add this to your budget. On the downside, there's no RAW shooting mode. I'm disappointed by this omission. This is a top quality camera that could be used for assignment. The sensor provides 6 megapixels of resolution, which is plenty for most situations. The lack of a RAW mode hamstrings the S3's potential. That complaint aside, this is an amazing camera that is bound to draw lustful glances from any serious amateur. You can purchase the S3 IS for about $460. That's a lot of camera for the money... especially in such a handsome, compact, rugged body. Voiceover adds a professional touch to slideshows. But you may not be ready to tackle new audio programs just to get a simple voiceover track. Even GarageBand seems daunting when you're in a hurry. Fear not, iMovie is a great tool for recording voiceover tracks that you can add to your slideshows created in FotoMagico or other applications. And the best part... it's really, really easy. First, create a new project in iMovie. Then click on the "Media" button (as shown above) and choose the "Audio" tab. Press the record button (as shown above) and start talking into your Mac's microphone. 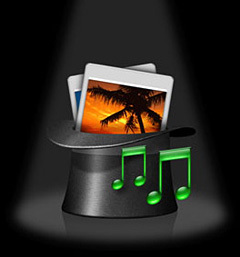 You might want to play your slideshow in FotoMagico as your talk so you can time the audio to the pictures. 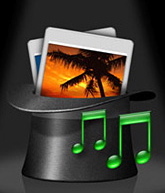 iMovie will place the audio file on your Desktop. Now, all you have to do is open FotoMagico and go to Slideshow > Add Audio... and choose your voiceover file. Like magic, your slideshow now has a voiceover track. This procedure might read a little complicated here, but it is truly simple and can be accomplished in minutes if you follow the steps. This tip is to help you prepare your entry for the FotoMagico Slideshow Showcase. Submit your Entry Form today (to get on the books), then start working on your presentation. Deadline to submit Entry Forms is May 30, and your presentation itself is due by June 15. Don't delay! 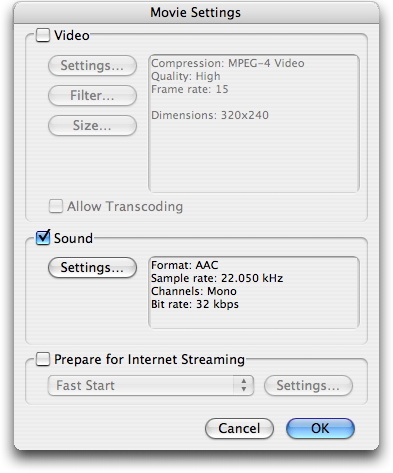 Many Mac OS X "Tiger" users don't realize that they have a powerful Raw converter bundled with their operating system. Every 10.4 Mac comes with a handy application called Preview that most folks think of only as a PDF viewer. 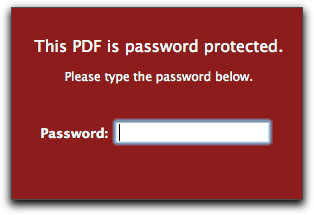 Even Apple touts its PDF capabilities without going into much detail about its hidden powers. The most notable of these lesser known features is Preview's ability to decode Raw files and convert them to other formats. It's true. You don't need Photoshop Camera Raw. You don't need Aperture. If you want to open a common Raw formatted image, just drop it on the Preview icon on your Dock. Preview will decode the Raw file and display it on screen. But wait, things get even better. 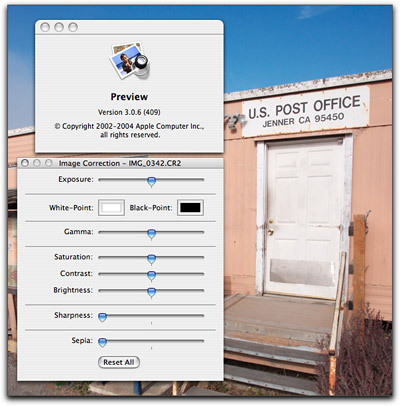 Go to Tools > Image Correction and you're greeted with a handy set of adjustments that include Exposure, Gamma, Saturation, Contrast, Brightness, Sharpness, and even Sepia -- all of which you can use for manipulating your Raw file. Would you like to read the metadata embedded in the file header? Go to Tools > Get Info and click on the Details tab. Tons of image data are revealed including dimensions, aperture, shutter speed, color space, and even the camera model used to capture the shot. When you're ready to convert the file, go to File > Save As and choose among four different formats: Photoshop, Tiff, PNG, and PDF. With the first three options, you can choose between 8-bits or 16-bits per channel. And if you choose the PDF format, you have more options including file encryption -- that's right, you can assign a password to your image to protect it from prying eyes. And yes, there's still more. You can rotate the Raw file, flip it, assign a Colorsync profile, then print the image. If you go to View > Customize Toolbar, you can add a cropping tool and even a Scale resizer. So not only can you zoom in and out with the Zoom tools, you can set the numeric amount to scale the image, such as 25 percent. Then crop it if you wish. Preview is an amazing photo editing application that's right there under your nose. If you haven't done so already, I recommend that you add it to your Dock, and use Preview whenever you have to make quick edits to a stray Raw file, or to save it to another format. For many simple jobs, this tool is faster than Photoshop. I used to resize all of my images to 640x480 before adding them to my slideshows, but that was before zooms and pans were easily included in these presentations. I still crop and resize many of my pictures, but now I take into consideration the resolution needed for zooming and panning. Those images have to be bigger than your finished slideshow dimensions. For example, let's say your finished presentation is going to be 640x480. But you want to have an image where you zoom in on a portion of the frame, maybe to show some detail. That picture needs to have enough resolution to maintain top quality as you zoom in. My rule of thumb is that I like to have at least 1280x960, but often I will go 2560x1920 if I think I'm going to zoom in tight. When choosing among candidates for zooming, examine the photo at 100 percent magnification. If the detail looks good, then the image will most likely hold up as you zoom in during the slideshow. Both iPhoto and FotoMagico enable you to create this effect in your presentation. It's not a technique that you want to overuse, but I think a few well-placed zooms or pans give your movies a real professional touch. And don't forget... iIf you wish to use FotoMagico to create your show, you can get a $10 discount off the software by entering "Digital Story" in the discount code box. Visit the order page and select FotoMagico. You'll be able to enter a coupon code at the first checkout page. The code is set to "Digital Story". Once the code is input, and the Checkout button is clicked, the $10 discount will be reflected on the final order total page. When you want one camera bag that provides everything you need for travel, take a look at the Lowepro Rolling CompuTrekker AW. Use its top handle to carry it, padded backpack straps to wear it, or in-line skate wheels to roll it. If the weather turns foul, pull out its all-weather cover to keep both bag and equipment dry. Need to go for a hike with your tripod? Expose its hidden tripod holder and attach your "sticks" to the outside of the bag. Oh, and want to bring your 12" or 15" laptop? No problem, there's space for that too. This $199USD bag (available from Adorama.com and other retailers) fits in the overhead compartment of an airplane or neatly in the trunk of your car. Zip open the main compartment to reveal enough room to fit a DSLR with an 80-200mm f-2.8 lens attached, plus room for lenses, flashes, and other accessories. There's a nifty digital goodie pouch (that's removable) that I use to store my batteries so they're always handy. You can arrange the padded dividers in the main area in various configurations to accommodate your particular needs. I like to bring a smaller Lowepro bag and tuck it inside the CompuTrekker. That way, when I head out for street shooting, I have a super-portable bag to complement the larger roller unit. I have rolling luggage that I use all the time, but none of my suitcases are as balanced or easy to tote as the CompuTrekker. The extending arm arcs to the perfect angle making the unit very easy to roll for extended distances. Other nice touches include a dedicated memory card pouch that's very accessible and a removable 12" laptop sleeve. 15" computer users can ditch the sleeve and slide their laptops directly into the front compartment of the CompuTrekker. In practical use, however, I prefer the bag without the laptop inserted. It makes for a slimmer profile that's easier to stash in tight compartments on the plane. If you need to fit the bag in even a smaller space, pull out the backpack straps and waistband from their hidden compartment. It's handy to stash them when using the bag as a roller, but the bad is slimmer when they're exposed. 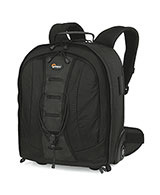 The Lowepro Rolling CompuTrekker AW's outer dimensions are 12.2W x 4.5D x 13.4H (inches) -- 31 x 11.5 x 34 (centimeters). It weights 8.8 pounds -- 4.4 kilograms. This is as close to a perfect travel bag as I've used. I have mine filled with one Canon 5D, 5 lenses, 2 flashes, Canon Rebel XT, and a handful of accessories (including the lighter "street bag." This one is a winner.